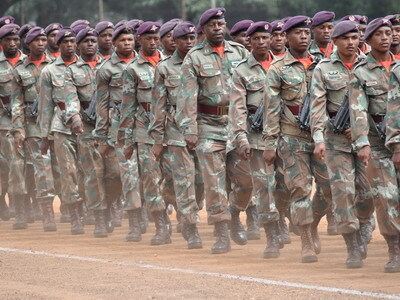 The SA National Defence Force (SANDF) personnel strength las year was 73 844 with 219 generals and admirals heading up the country’s military. The senior staff complement is made up of one general – SANDF Chief General Solly Shoke – eight lieutenant generals/vice admirals, 40 major generals and 170 brigadier generals. This is according to a written reply to a parliamentary question posed by opposition Democratic Alliance (DA) party shadow defence and military veterans minister Kobus Marais. The answer was supplied by Defence and Military Veterans Minister Nosiviwe Mapisa-Nqakula. The highest rank to which a woman has yet been promoted in the national defence force is major general/rear admiral with five blacks, one Asian and one white carrying the two star rank. There are 22 African women carrying the rank of brigadier general/rear admiral (junior grade) with whites second at 20, followed by 16 Coloureds and three Indians. Overall there are 170 brigadier generals/rear admirals (junior grade) in all four arms of service of which 114 are black, 29 white, 21 Coloured and six Indian. Those in the rank just below the star carrying ones – Navy captains and colonels in the SA Air Force (SAAF), SA Army and SA Military Health Service (SAMHS) – number 863 in total with 506 Africans of both sexes the dominant group. There are 263 whites in these ranks with 64 coloureds and 20 Indians. The answer given to Marais lists only two classes of sergeant major/warrant officer – one and two – and in total the senior NCOs, widely seen as the backbone of any military force, number in total 5 403. They are backed by staff sergeants, flight sergeants and chief petty officers numbering 7 048. In both rank levels by far the majority are black (1 971 warrant officers and 3 563 staff, flight sergeants and CPOs). The numbers supplied by the Minister show there are more than ten thousand civilian employees in the SANDF/Department of Defence (DoD). This just over six thousand more than the bulk of any military – its privates, rifleman and air- and seamen. Across its four services the South African military totals 16 705 men and women in this rank. Again the demographics are in line with the South African population. Blacks total 14 595, Coloureds 1 615, whites 358 and Indians 137. No breakdown is given per service. According to the latest Department of Defence annual report, the Department had 75 555 personnel in its employment in February 2018. As of 31 March 2018, the SA Army had 38 572 personnel in its ranks, the SA Air Force 9 652, the SA Navy 6 992 and the SA Military Health Service 7 624. Other divisions such as Legal Services and Human Resources accounted for several thousand others.